When your teenage kids lose it! Following the declaration of State of Emergency in Tripoli on fighting between rival armed groups.A Diaspora Initiative, Migration Enlightenment Project Nigeria has called on would-be migrants to seek legal and safe ways of realizing their goal to avoid unnecessary suffering and deaths. A report by the UN refugee agency UNHCR, issued on Monday (3 September), says that while the number of migrants arriving in Europe from Libya has dropped, the proportion of people lost at sea has sharply increased. “A higher proportion of people are dying at sea, with one death for every 18 persons who arrived in Europe via the central Mediterranean route between January and July this year compared to one death for every 42 in the same period in 2017,” notes the report. 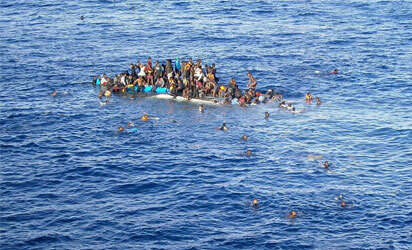 Some 1,600 people are feared to have died on the central Mediterranean route from the start of the year to end of July. The latest report poignantly shows that seeking to cross the sea amounts to sheer suicidal adventure. In a statement signed by its Co-Project Directors, Migration Enlightenment Project Nigeria, Kenneth Gbandi and Femi Awoniyi said, The renewed clashes have plunged Libya in yet deeper chaos, further jeopardizing the lives of about 8,000 migrants trapped and arbitrarily detained in the city’s detention centers. Many of these detainees are Nigerians. The recent fighting demonstrates that Libya is not a safe place and would-be migrants to Europe should avoid that country as they will be exposed to mortal danger. In view of the foregoing developments, the Migration Enlightenment Project Nigeria would like to advise would-be migrants to seek legal and safe ways of realising their goal to avoid unnecessary suffering and deaths.